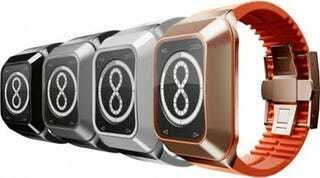 Consider it an IQ test for potential new friends: Those who think you're wearing an infinity watch pass; those who just see an "8"...well, we're sure they're still very nice (*ahem* Matt Buchanan *ahem*). Complicated at first glance, this DOGNE watch breaks infinity into a 24-hour clock. Then minute information is displayed along the periphery.